Turn these awesome board games into handwriting games to increase interest and entice reluctant writers! We all know kids who hate handwriting with a passion. The minute those pencils and paper come out, you start to hear the murmurs, groans, and complaints. Some kids hate handwriting because they’re fidgety or have difficulty focusing on the task and staying in their seats. Others struggle with using a functional pencil grasp and may fatigue easily or even experience pain in their hands/fingers because of the way they hold their pencils. And still others just can’t seem to execute the visual perceptual and visual motor components of handwriting, including sizing, spacing and alignment. No doubt about it, handwriting can be tough for a lot of kids and it’s one of the most common reasons for referrals to occupational therapy in the school setting. The good news is that there are plenty of ways to make handwriting a little more fun and interesting for even the most reluctant writer. One of my favorites? Board games! 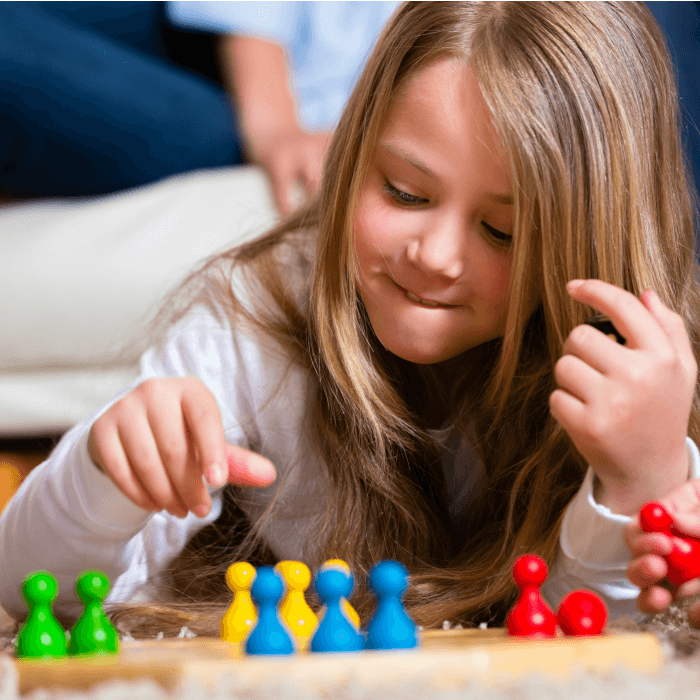 These 10 board games (and card games) are the perfect way to keep kids actively engaged in handwriting tasks – trust me, they’re way more fun than that boring old worksheet! Most of these ideas are great for kids who are currently working on writing letters and/or writing at the word level. 1 || Try carrying games over between multiple sessions. Using board games as handwriting games typically makes the game take a bit longer than it normally would. Rather than rushing, try making note of where you left off and then pick up the same game again across multiple sessions. 2 || Silent play can make things more fun and increase opportunities for writing. Making a rule that there is no talking during the game is a great way to get kids’ attention – they love doing familiar tasks in a different, more interesting way! And when kids aren’t allowed to talk, it means that they have to write their answers or write things down to communicate. It’s a win-win! 3 || Assign a scorekeeper! Younger, less experienced, or struggling writers may need a different role during these games. Can they act as scorekeeper – writing down all of the players’ names and keeping track of points? 4 || Use turn-taking to your advantage. While one person is taking his turn, the person who went before him can be writing her word/answer. This way, game play is continuous and the whole group is never waiting for one person to write. 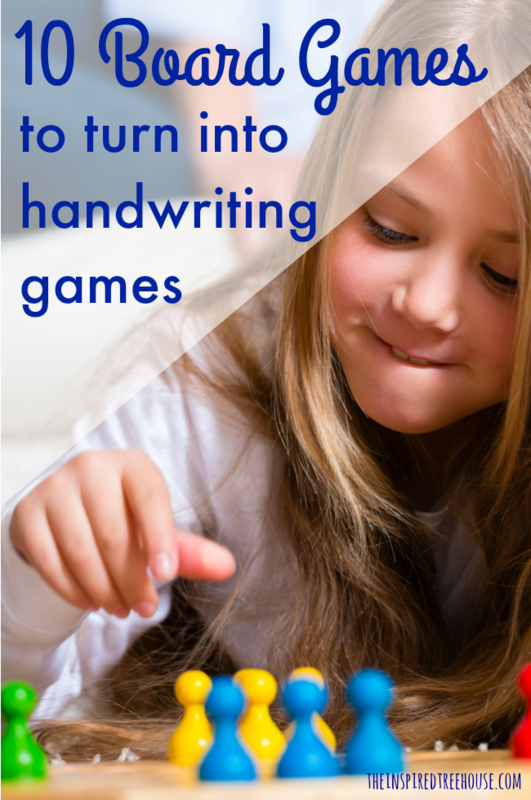 5 || Use games as an opportunity to trial adapted handwriting paper and grips. Game play can be a low-pressure way to try out different types of lined paper and to see which pencil grip works best for which kid. This is one of my favorites for slightly older kids and is an awesome game because it targets speech and language concepts like divergent naming in addition to handwriting, as kids have to make a lists of objects that fall in various categories. The added challenge? All of the objects have to begin with a certain letter! Make it a handwriting game: There is no real adaptation needed to make Scategories into a handwriting game, as kids are already writing their answers down. Sub out the lined answer sheets that come with the game to use adapted paper as needed. Another one of our favorites in therapy and at home. Spot it targets visual perceptual skills and can be easily made into a handwriting game too. Each card in the deck has eight different symbols on it, with the symbols varying in size between cards. Any two cards will have exactly one symbol in common. The game cards are placed upside down and the top 2 cards are revealed. Whoever spots the symbol in common on both cards first, gets the first card. Then another card is revealed for players to search, and so on. Make it a handwriting game: Make it a “silent” game! Instead of shouting out the answer, kids have to write down the word for the picture they find on both cards! This a great game for new and emerging readers. Kids love sliding the “Zinger” to get the letter tiles to pop out and then they use the tiles to fill in the blanks to create simple words. There is a whole line of Zingo games for kids of different ages and abilities! Make it a handwriting game: This one’s easy – simply have kids write their words on their paper after they build them! Make it a handwriting game: If another player says “yes” to a question, the other player has to write down that character trait. This way, each child is making a list of traits the character has and can check their remaining characters to see if they fit all of the descriptions on their list! The kids version of the old classic, Scrabble Junior is awesome for new readers and kids who are learning to put letters together to write words! Bonus – the game board has two sides, one for beginners and one for more advanced players. Make it a handwriting game: Another easy one – simply have kids write the word they formed on the game board after each turn! In this fun game, kids place cards (without peeking!) and place them in their adjustable headbands, facing the other game players. Then, each player asks yes or no questions to the group to try to figure out what is on their card. Make it a handwriting game: Similar to Guess Who, to make HedBanz into some handwriting fun, have kids write down the clues they find out from other players as they ask questions about their own card. For example, if they ask the group “is my card an animal?” and the group answers “no”, the child would write down – “Not an animal”. Then, the child can use his paper to remember the clues each time he takes a turn. Everyone knows how to play charades – you can play with or without the charades game cards available here. But have you ever tried Reverse Charades? This game is tons of fun, because instead of one person acting something out for the group, the group acts something out together for one person. It’s a new, hilarious twist on an old favorite! Make it a handwriting game: Make it a silent game! That’s right – no talking! So if you’re playing regular charades, kids can’t call out their guesses – they have to write them down and show the person who is acting out the clue to see if they’re right! Same for reverse charades – have the person who is guessing the clue write down their answers instead of calling them out! This is another great team building game. On each card, there is a base word and four words that you can’t say to describe the base word. Each child draws a card and tries to get their team to say the word using other descriptions and related words without ever saying the four other words on the card. Make it a handwriting game: Make a rule that the team can’t call out their guesses – they have to write them down! For this game, a child picks a card, reads the topic, and then starts the 5 second timer. With only 5 seconds, can they name 3 things that fit the topic? Make it a handwriting game: You’ll need to add some time to the clock to make this into a handwriting game. Challenge kids to write their 3 answers instead of calling them out. Decrease the length of time for more of a challenge or add more time to the clock to make it a little easier. Change how many items they have to write down in the category as needed. Make it a handwriting game: Have kids write their answer after hearing the definition instead of calling it out. So what do you think? What are your favorite ways to make handwriting even more fun for little ones? Share your ideas in the comments below! 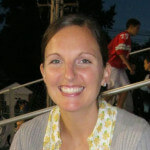 Looking for other awesome ideas for encouraging reluctant writers? Check these out from The OT Toolbox!